A number of variations for the umbrella design have been introduced to us. The latest installment is known as Kazbrella that folds away in a less awkward manner when compared to a conventional umbrella and also eliminates dripping. The Kabrella has been designed by an engineer and invetor, Jenan Kazim. The gadget provides the claimed benefits by folding down at the center while employing a double-spoke mechanism. The umbrella folds from the centre and keeps the water drops from dripping when folded. This prevents water spilling onto the floor too once the umbrella has been placed down and trousers getting wet when they are brushed against it. The Kazbrella opens in a unique manner; up and over motion instead of out and up motion like conventional umbrellas do. This translates into an easy opening and closing of the umbrella upon entering or leaving a car/building while also make it less awkward when you have to open or close it in a crowd. The double spoke mechanism makes the umbrella stronger than the conventional umbrellas and imparts better performance in windy conditions. It is also responsible for facilitating the center collapsing system. When wind forces it to blow inside out, you can simply pull the mechanism downward and then back up slightly. This pops the canopy right back into the shape. As per Kazim, the biggest challenge he had to face was to come up with the inside out folding system while also keeping the curvature and thus the usability that a traditional umbrella imparts. He made use of ‘high-end’ materials to ensure an amazing build quality. 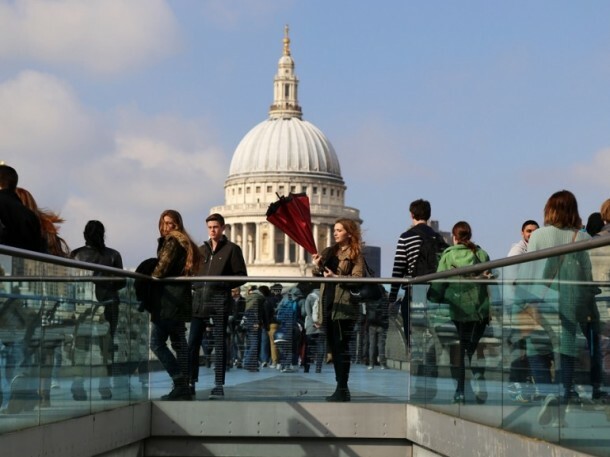 Kazbrella’s shaft has been made from aluminum that is aircraft-grade, spokes of lightweight fiberglass and a double canopy of pongee polyester that has been covered with coating, which is water repellant. As of now, a Kickstarter campaign is being run to raise funds for the production. If all goes according to plan, the deliveries will start in October.